Seattle's $275-per-employee "Head Tax" (EHT), which was to be levied against every business with over $20 million in revenue, was repealed on Tuesday by a 7-2 City Council vote. City leaders' abrupt repeal occurred when it became obvious that a referendum effort would gather far more than enough signatures to qualify for the November ballot. 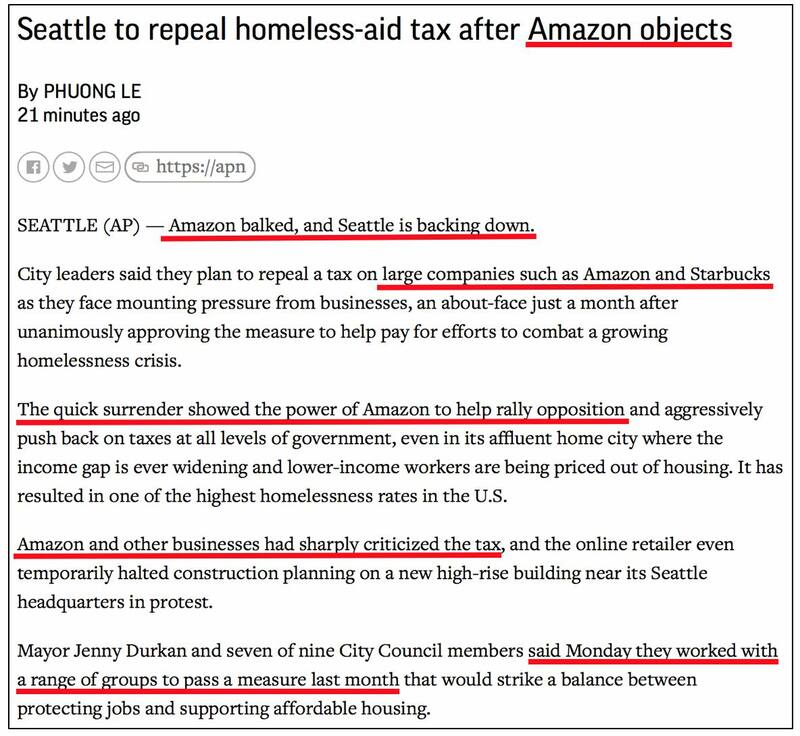 In a 1 p.m. Eastern Associated Press dispatch published before the vote, Amazon-obsessed reporter Phuong Le was extraordinarily bitter and hostile. Both in her coverage of the EHT's passage and its imminent repeal, Le has pushed the myth that Amazon was the predominant source of the tax's original opposition, and then the primary, blackmailing force behind repeal. Anyone following local Seattle coverage of the EHT saga would know that Le's "blame it all on Amazon" spin is untrue. Le wanted readers to believe that this tax was no big deal because only filthy-rich "companies like Amazon" or "businesses such as Amazon and Starbucks" would pay it. The 3 percent figure still grossly understates the impact. Since the tax was projected to raise $48 million per year, affected businesses would have paid the EHT on roughly 175,000 employees. That's far more than 3 percent of Seattle's private-sector workforce. Companies affected by the EHT would have included thin-margin grocery chains and retailers, firms with only a couple of hundred employees, and even the local Seattle Times newspaper, whose editorial board opposed the tax and openly advocated its repeal (while insisting that its position did not influence its news coverage). As seen above, Le completely failed to describe the nature of the tax. Incredibly, she didn't do so until Paragraph 13. Although the company halted a building's construction when the $500 EHT was proposed, it reversed course after the tax's lower level passed. After the EHT passed, Amazon said that it was "disappointed by today’s City Council decision to introduce a tax on jobs," while also indicating that the city's "hostile approach and rhetoric toward larger businesses ... forces us to question our growth here." It certainly wasn't alone in that posture. 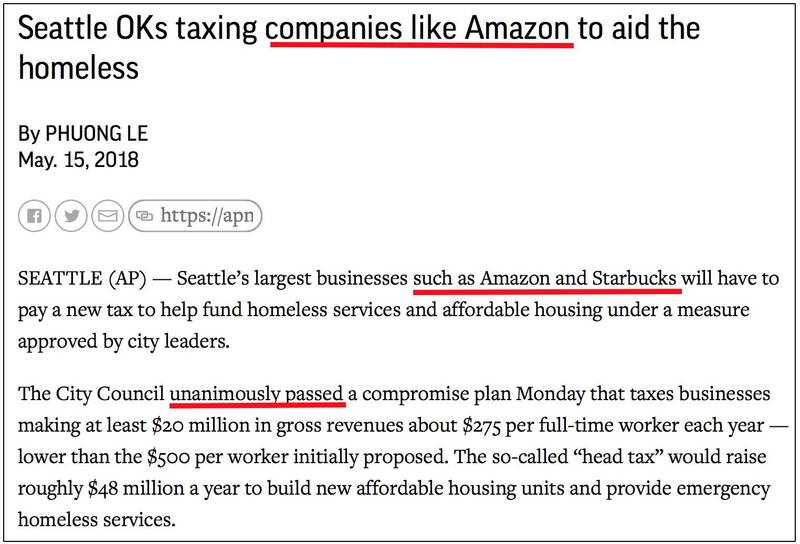 Amazon is no corporate saint, but the fact remains that an overwhelming majority of people and companies, even in ultra-liberal Seattle, opposed the tax, including 80 percent of businesses in a pre-passage survey City Council itself was aware of. The $25,000 Amazon pledged towards the $300,000 repeal effort was disproportionately low compared to its potential $12 million annual share of the tax. Le's story headlined Amazon and mentioned it four times in her first four paragraphs (seven times overall). By contrast, the Seattle Times story on the tax's imminent repeal mentioned Amazon just three times in 39 paragraphs.